A funny thing happened as I'm looking at this row NOW, ! ! The bottom block is upside down?? I'm not changing it now. 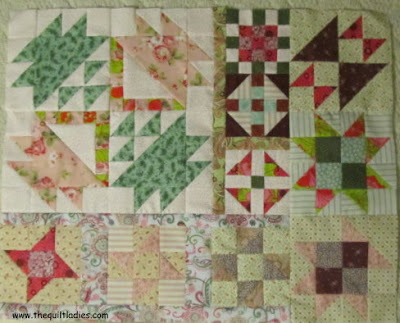 This is a good time to do my, "Stop taking quilting so serious talk !" Please relax and enjoy. My quilt is not a contest piece, a cover shoot, it's a curl up and take a nap quilt. I know whom ever gets under it will NEVER notice or care that this little pink basket is upside down. And personally, I like it ! I try hard, but I'm NOT ever going to be perfect. ! Sew this on to the right hand side of last weeks. If you missed any of the 52 weeks patterns, NOW is the time to get them, when they are gone, they are gone. 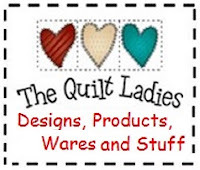 The Quilt Ladies Store Logo Practice TIME !